Why are death rates falling at older ages — will these trends continue? Life expectancy at age 60 years has improved steadily in the past three decades in developed countries and in many developing countries. A paper written with colleagues Gretchen Stevens, Ties Boerma, Richard White and Martin Tobias, published in the Lancet this week (http://www.thelancet.com/series/ageing), looks more closely at improvements in older age life expectancy and asks whether they vary by country and region, whether mortality is being compressed into a narrower band of older ages as we approach an upper limit for human life span, and what are the main causes of the decreases in death rates of older people. Improvements in older age mortality were mainly atrributed to decreases in tobacco use (for men) and in cardiovascular disease mortality (for both men and women). 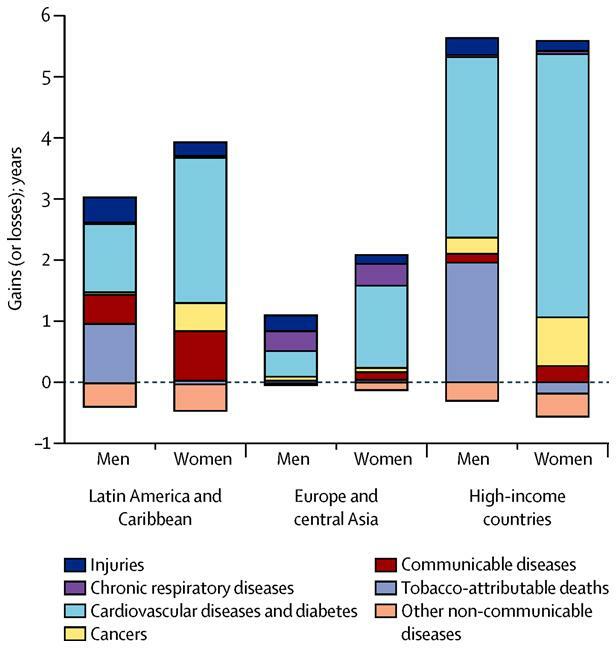 In high-income countries, reduction in non-tobacco cardiovascular disease and diabetes mortality contributed most to gains in life expectancy at age 60 years between 1980 and 2011 (3·0 years for men and 4·3 years for women). Reductions in tobacco-caused mortality had an important role for men, contributing 2·0 years of increased life expectancy, but for women, deaths caused by tobacco rose, resulting in a reduction in life expectancy of 0·2 years. For women, non-tobacco cancer mortality also fell, leading to a 0·8 year rise in life expectancy; for men, reductions in non-tobacco cancer rates only contributed 0·3 additional years of life. The following figure summarizes cause contributions to gains in life expectancy at age 60 over the period 1980-2011. We also examined whether mortality is being compressed into narrower and narrower bands of age as people live longer. James Fries originally proposed that this would happen as populations approached the maximum biological life span for humans. When he published in 1980, he hypothesized that this limit was 85 years, a limit already exceeded over the next decades by Japanese women’s average life expectancy at birth. We used the Kannisto C50 indicator—the smallest age range in the life table that includes 50% of deaths. C50 is always less than or equal to the interquartile range and has the advantage that for countries with low mortality in children and younger adults, it focuses on the age range at older ages, in which most deaths are concentrated. We found that the Kannisto C50 index provides no clear evidence for compression of mortality in any region on the basis of aggregated data for 50 countries. The paper also looked at trends in avoidable mortality using an approach which assessed avoidable deaths through comparison with mortality in the best performing so-called frontier countries. We found mixed patterns, with avoidable mortality decreasing for males in high income countries, stagnant for females, and rising for middle-income European countries and to some extent in Latin America. Our results support the view that substantial gains in older life expectancy can be achieved in developing countries in all regions, mainly through improvements in control of non-communicable diseases and their established risk factors. This entry was posted in Global health trends and tagged life expectancy, longevity, preventable deaths. Bookmark the permalink.